This branch was started on Feb-14 986. Traffic Challan in Madhya Pradesh the traffic challans are issued at the time of traffic violation like jumping the signal point to drive against traffic rules like to drive in opposite way than the traffic officials wrote the challan on traffic violators on the spot challans sent through the post registered address of the violators but nowadays the Central and State Government using the technology of by clicking the photos of traffic violators. And they have to pay the e challan the violator can pay them through the online with the help of any debit card or credit card etc. How to Check and Pay Madhya Pradesh(MP) Traffic Echllan Online? click over the link then you will get the Madhya Pradesh Police e-Challan page. 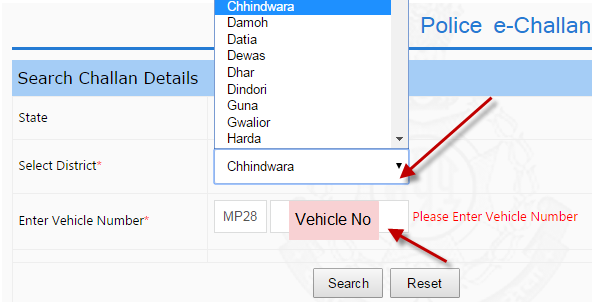 2.Select the state is always default "Madhya Pradesh"
3.Select the District where the vehicle took place. If you have any pending echallan then you will get eChallan Details. If it shows the no challan for a paticular vehicle then it means there no challan no need to pay. If there is any challan on your vehicle goes for pay challan option then make sure your payment. It very easy way to pay the e-Challans it can save time and energy you have view the challan details and pay through the online.